Here's the hypothetical situation: We're teaching a class of pre-service English teachers in the upcoming semester. Being old fashioned, we still like books. Since they want to be teachers of English, we're taking a leap that they do too. So, as a result, for this course, the books and readings listed below will be required. 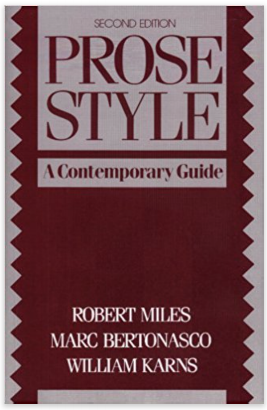 Though everyone should have a copy of Strunk & White's Elements of Style, for the new millennia, I'd like us to look at Miles, Bertonasco & Karns's text, an entertaining guide to writing what Professor Bertonasco taught at New Style - pithy, entertaining, and informative. This text is the basis for how I learned to write clearer. It's also the basis for how I helped my students to write clearer. To use: Internalize each chapter. Synthesize the information for class lessons. Model your own examples and practice examples on those provided for you. I say to model yours after theirs because a) they write for a college audience, b) you need to tailor the examples to your students, and c) copyright. The updated version (2017) of the MLA Handbook is the definitive text for formatting the English paper. If you have an older copy, you need this one. The 8th edition carries new rules and guides for inclusion of digital references, references that your students will use and need to properly format. No teacher of English should be without. What is the teaching of literature without Louise Rosenblatt? Nothing. As such, we will read Rosenblatt's work explaining the connection between reader and text. We will be examining Rosenblatt's seminal work together this term. As such, you will read it with an eye to its usefulness in application to your classroom lessons and your pedagogical knowledge. Keeping everyone on the same page, literally and figuratively, can be a daunting challenge. Beers provides some effective methods and strategies for making English content accessible yet challenging to students at all levels. She draws on both contemporary research and her own tenure as in the ELAR classroom to tackle the dilemma faced by teachers of English who are faced with a classroom of students exhibiting a broad range of reading abilities. I know, right? Comics. Who knew that when I read my first graphic novel, Watchmen, in 2007, because one of my colleagues wanted my opinion on whether or not it was literature, that ten years later I would be studying the genre during my doctorate. All I can say is, Thank you, Dave. My initial assessment, however, was made without the benefit of McCloud's expertise. Reading his text will allow you to learn how to decode the graphic novel, an invaluable bit of knowledge for teachers of English. The first thing this skill helps you do is teach your students how to analyze graphic novels. (If it's in the budget, request a class set; regardless, have a spare copy in your student library to loan.) The second thing this work can do for you is give you the ability to knowledgeably assess graphic works for classroom use - there is a difference between an illustrated classic and a graphic adaptation of a classic - the first adds pictures to words; the second entwines pictures with words so that one without the other leaves a gap. As a teacher of English, you are the authority on what works come into your class, on which texts will help you teach your students to think and to analyze, to reason and to wonder; Understanding Comics: The Invisible Art will help you teach them how to do just that in the graphic world. These are a few articles, in addition to those noted on the downloadable, that you will be reading for our course. Be certain to apply Adler's concepts. "The Artistic. Aesthetic and Curriculum." Maxine Greene. 1977. You will need to go through your local library to download. It is located in Curriculum Inquiry, Volume 6, No. 4, pp. 283-296. This seminal work explores the role of aesthetics in education and, more, in the development of the student's soul toward wide-awakeness. "Those Who Understand: Knowledge Growth in Teaching." Lee S. Shulman. 1987. Again, use your resources to find the article. It's located in The Journal of Education. Volume 193, No. 3, pp. 1-11. A well penned explanation of what it takes to teach at the secondary subject level and a defense of such instructors. Though not required texts, the following is a list of texts that you should acquire for your self at school. As you gain money, add these to your library. This section will be added as we build our experience with preservice teacher educators. Though we recommend looking at Atwell and Elbow, Greene and Schopenhauer, Noddings and Darling-Hammond while we work.